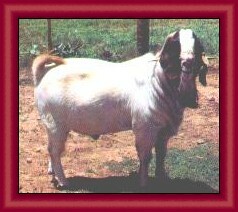 Antelope Creek Ranch is the home of Texas Twister, Premier Australian Boer Buck, and goats from other famous, award winning bloodlines. 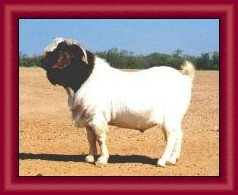 Antelope Creek was the winner of the ABGA National Grand Champion Premier Percentage Exhibitor / Breeder Award in both 1997 and 2000. The 2000 ABGA National Reserve Champion Percentage Doe, 2000 ABGA National Reserve Champion Junior Percentage Doe and The IBGA National Reserve Champion Senior Percentage Doe are from Antelope Creek Ranch. 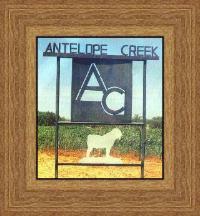 In 2002 Antelope Creek had the first place senior percentage doe at the 2002 ABGA National Show, which was also the first place senior percentage doe at the IBGA 2002 Western National Show and was declared The IBGA 2002 Western National Champion Percentage Doe. Her name is Twister's Juliette. Finally and most importantly, Antelope Creek Ranch is the new home of the world famous buck Tarzan T66 who was the first place senior buck at the 2002 San Angelo Texas Livestock Show, second place senior buck at the 2002 ABGA National Show and also first place senior buck at The IBGA 2002 Western National Show and was declared The IBGA 2002 Western National Champion Boer Buck. 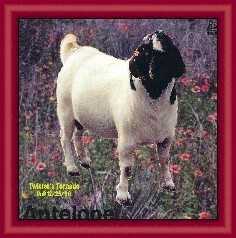 Tarzan is the only boer buck to have national champion titles on two continents, as he was also the 2001 Australian National Reserve Champion Boer Buck. 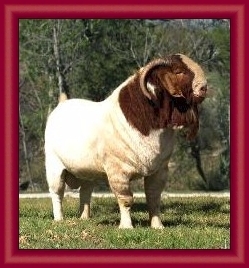 We plan to breed Tarzan to does out of South African world champion bucks, which will give the offspring pedigrees that have national champion titles from three continents (South Africa, Australia and USA). We guarantee everything we sell and visitors are always welcome. Copyright© 2001-2006 All Rights Reserved.